A city immersed in art and culture evokes expectations of creativity, quirk and fun. Add in sport and there's passion and excitement. Mix with natural scenery and you get beauty and pleasure. Combine all of these characteristics and you have one of the most diverse cities in the world: Chicago. Visiting Chicago any time of year can be a treat, however if you’re sensitive to cold, winter visitors need to “bundle up”. The “Windy City” being the 3rd largest metropolitan city in the United States, is jam packed with things to see and do. Keep in mind, the city is directly on Lake Michigan and is the most “walkable” city in the U.S. they say, so bring those sneakers and leave the high heels for the evenings out on the town. The best time to visit Chicago for reduced rates and room availability is after Christmas during the winter months of January through March. Magic Savings Tip: Many of Chicago’s popular attractions and museums offer “free days”; so check visitor’s booths and hotel information centers for lists and coupons. Also, these attractions are busiest at mid day and early afternoons, so go early or late. Refusing to be pigeon-holed into a single category, Chicago caters to every kind of traveler. The diversity of the city's attractions is matched by its accommodation. 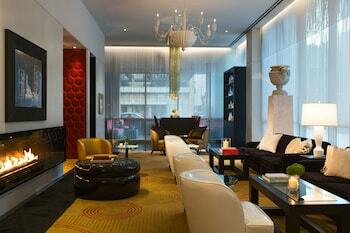 From the most luxurious to the more modest hotels, there are always deals to find in the "windy city". Chicago is the largest and most visited city in the Midwest. With so much ground to cover you need to know where the most convenient places to stay are. It all depends on what Chicago highlights most interest you. Between April and October a visit to the Buckingham Fountain rewards you with a spectacular light show. This fountain is one of the largest in the world with its four sea horses. Another must see is the city of Chicago and beyond, from the to of the tallest building in the world, the Willis Tower. Chicago has its infamous past of gangsters and crime, so what better do than take a “Chicago Gangster Tour”? Visit the Biograph Theatre where FBI gunned down John Dillinger, and the Mount Carmel Cemetery and Al Capone’s final resting place. During summer months, enjoy one of the outdoor concerts at the Jay Pritzker Pavilion. You should visit the two most popular museums in Chicago, the Museum of Science and Industry and the Field Museum. Another popular destination is the largest U.S. collection of impressionist artwork located in The Art History Museum. Evenings you may want to take in the Joffrey Ballet or Shakespeare Theatre. On a sunny spring, summer or fall afternoon, strolling the Lincoln Park is a rewarding and pleasant experience. For the whole family the Brookfield Zoo supplies lots of fun and entertainment. When visiting Chicago there are two things you must do, eat a real Chicago Dog and dine in a real old time Chicago Diner. These diners are going away fast, and as part of history you should experience a diner lunch special at least once while you can. The food isn’t always 5 stars, but its good and won’t break the bank. For your Chicago hot dogs, try Hot Doug’s, Superdawg, Gene and Judes, or Pluto’s. If a fan of deep-dish pizza, you’re in the city that invented it, so ask around and find your pleasure. If you want to visit one of the oldest “speakeasy” bar restaurants and “mob hangouts” of old, then head to “The Green Door Tavern” on New Orleans Street. One of Chicago’s most favorite watering holes today, try one of their prohibition-style cocktails while scanning the great menu for lunch or dinner. Visit Lake Geneva, Wisconsin for a day where you can visit shops, play some golf or maybe rent a boat and cruise. You can also visit Starved Rock where you can have a “Grand Canyon” feeling while walking over 44 paths overlooking nature’s canyons. Chicago is the largest and most visited city in the Midwest. With so much ground to cover you need to know where the most convenient places to stay are. Millennium Park is the most popular meeting point in town and its artistic structures are a huge attraction. 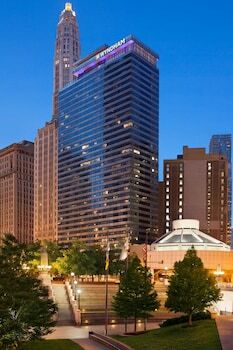 The Allegro Chicago Hotel puts you in walking distance of this famous location and close to the upscale shopping found on the Magnificent Mile and State Street. 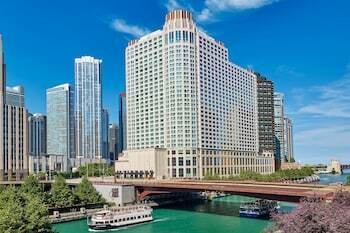 The Hotel Burnham or the Intercontinental Chicago are the perfect hotels for a vacation filled with museums, entertainment and fine dining. The places to see in Chicago are in a relatively compact area so you can see all you want without venturing far from your downtown zone hotel. But what should you fit in to a tight schedule? It's a great place to spend a few days, and you'll find a great place to stay in the downtown area. Let's start with some shopping! I know, I know, but this place does have a stellar reputation for first class shopping so bear with us. Head for the boutiques along Armitage as they tend to be smaller and more personal (most are independently owned rather than chain stores). 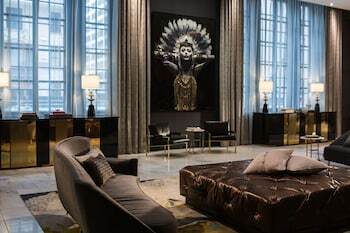 This is truly the city's chicest destination and while the Magnificent Mile does the grand and showy thing very well, this is where you'll find the most interesting stuff. A 'must-do' in this city is the Architectural Cruise on Chicago's First Lady. Guided by architecture buffs, the boat takes you through various waterways that lay out its claim to being one of the architectural gems of the world. You'll see all the famous buildings from the comfort of a boat and see them from an angle that gives due deference to their size and grandeur. The Lincoln Park Zoo is a beloved local institution and you'll see why the locals love it as soon as you step foot inside. It's a great mix of indoor habitats and naturalistic outdoor environments and the really good news - it's free! Don't miss the Regenstein African Journey exhibit (which re-creates both a tropical jungle and a dusty African savannah). The hustle and bustle of Chicago will remind you that you're in a big city - but equally the startlingly good things designed for family fun will remind you that every city can provide great attractions for people to enjoy. There's plenty of excellent accommodation to be had on our site and you can really live it up on the savings. Head down to the lakefront - this is where most of the action is in terms of attractions. The Navy Pier, for example, is a 50-acre playground with a 15-story Ferris Wheel and an Imax theater. You can eat here, check out the interactive things to do and stay on for a movie - what better day! The Shedd Aquarium is also on the lakefront. The strange and exotic rule here so get ready to get up close and personal with a Piranha or two and check out the amazing moonfish. You'll also find a baby beluga whale here called Naya - so bring the kids. The more active members of the family will love the Skyline Lake Tour where you all jump on a cruise boat and take in the skyline from a very different point of view. The panoramas and the extraordinarily iconic views of that great architecture make for fabulous pics, so bring the camera. Fancy a top of the town experience? The Sears Tower is not only one of the world's tallest skyscrapers, it also boasts a 360 degree view across four states. They know how to build a building in Chicago! Sure, it's probably not the major reason you're visiting Chicago, but it is a great excuse to set out on a voyage of exploration around Chicago that will take you through dozens of striking Chicago features. Check cheaprooms.com to find a central hotel in Chicago and let the creative imaginations of great architects inspire you! On the way you'll undoubtedly come across Chicago's second great claim to fame - its shopping precincts - as well as a range of fine dining options. 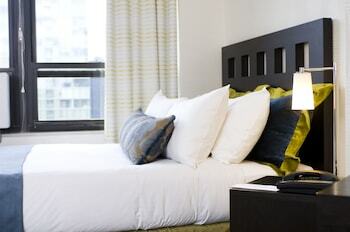 Find Chicago rooms in the downtown area on our website. There are plenty of bargains to be had, but be quick for the better properties. Most cities make their statement of world citizenship with outstanding Cathedrals - buildings that pay homage not only to God, but to the creative spirit, financial acumen and abilities of the inhabitants. Old St. Patrick's Church at 700 W. Adams St. is not big, but it is exquisite. Chicago's oldest public building was erected in stages, with the great onion dome and spire finishing the building 30 years after it was started. The magnificent stained glass windows were added in 1912. The Museum of Science and Industry on E. 57th St. and S. Lake Shore Dr. is two birds with one stone! Not only do you get to enjoy a splendid neoclassical building, you also get to explore one of the finest museums in the country in the beautiful lake front area. The exhibitions within are first-class and the sheer grandeur of the building adds gravitas to a great day out. If you want to see a fabulous reminder of Chicago's pivotal importance as a railway hub in the 19th and early 20th centuries look no further than Union Station at 210 S. Canal St. It's a stocky, permanent structure on the outside which gives way to the extraordinarily graceful grand hall and curved glass ceiling on the interior. The Sports Fan's Guide to Chicago! Taking on a 'theme' for your visit to a new city is a great way to forge an exciting itinerary - whether it's a mission to explore all the literary highlights of a city or, in this case, the sports highpoints of Chicago. Go to Cheaprooms.com and find a great Chicago hotel room from the more than 520 to choose from. Then take our suggestion to base your explorations around the sporting highlights of this sports-mad city - you'll see a huge range of other 'must-sees' at the same time. Find cheap accommodation in Chicago now and take a look at the home of the Bulls, the Cubs and Wrigley Field. Speaking of Wrigley Field this is a great starting point - after all there's 98 years of history here, including the magnificent Babe Ruth. Catch a Red Line train with the 'Howard' destination and then revel in the behind-the-scenes tour that takes you into the bleachers, the press box, the Cub's dugout and the Cub's clubhouse plus the outfield. Over at U.S. Cellular Field you can explore the home ground of the White Sox and old Comiskey Park. The ballpark is located just off the 35th Street/Sox Park station of the CTA Red Line. Many Chicago-style pubs and bar dot the surrounding area and the suburb of Bridgeport is an interesting one to stroll around. The Bulls play their home games at the United Center, as do the Ice Hockey Blackhawks. It's at 1901 West Madison Street, not far from Downtown. They love their hometown heroes and you'll find statues of Michael Jordan, Bobby Hull and Stan Mikita on the eastern edge of the stadium. Sundown in Chicago means it's time to get up and go in the windy city. Put on the glad rags, get out your dancin' shoes or dress for a night at the Opera - Chicago has your number. CheckCheaprooms.com first of all and get yourself a room in Chicago close to the downtown hotspots and 'do' Chicago after dark. How about a laugh first up? Second City on N Wells has been in the comedy business for more than 50 years - launching the careers of Bill Murray, John Candy, Mike Myers, Chris Farley, Tina Fey, Steve Carell, Amy Poehler and Stephen Colbert. It's close to the Lake near Old Town Triangle. 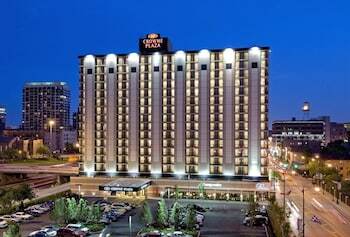 Find cheap accommodation in Chicago close by at great shoulder season rates. If you want great jazz (and Chicago is the home of great jazz), then get down to Green Mill at 4802 N Broadway, Far North Side. The place often features guest artists and the house band are no slouches either. For the party-hard crowd who like the cutting edge of new music, try Original Mother's. A local institution since 1960 they've been featuring new music since the beginning and it's an opportunity to see what the country will listening too in five years time! 26 W Division St, Near North. 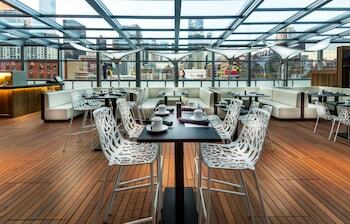 World music, fun, party music, Latin beats - try HotHouse at 31 E Balboa Ave, South Loop. 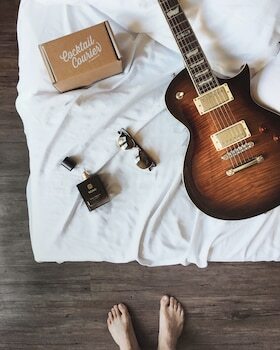 Of course you want some blues; but where to go? Try B.L.U.E.S at 2519 N Halsted St, Lincoln Park. It's the city's premier blues joint and even on a 'non-star' night, the music will blow you away. Late night, a few drinks? Every barfly needs some late night eats - and sushi works a treat (not too heavy just before bed). You'll find great Chicago sushi at Yuzu Sushi and Robata Grill, 1715 W Chicago Ave.
Take a walk on the mean streets! Chicago is well-known for its architectural gems - and the best way to discover them is on foot Go to cheaprooms.com now and find a cheap hotel in Chicago and pack your walking shoes to enjoy some of Chicago's finest contributions to world architecture. Chicago's downtown area is relative compact and the vast majority of scenic and tourist sights are within a mile of the lake shore. Although you can explore much of the city on foot, it's worth buying a CTA pass which is good for all-day travel on the buses and trains throughout the entire Chicago downtown area. The 7-day pass is $23. The Loop area has the overhead trains which offer a strangely familiar sound as the trains reverberate overhead. The Chicago River which feeds into the lake creates a neat city divider and on the south side of the river lies the famous Millennium Park. This is everything you've read about and more. It's a naturally verdant and pretty two mile walk around past the museums at Soldier Field. Here's where you'll find the Field Natural History Museum, Shedd Aquarium and Adler Planetarium and this is a great location for viewing the Chicago skyscraper skyline. You'll find one of Chicago's better outdoor sculpture pieces - the Buckingham Fountain. Just make sure you stand upwind! Walk back towards the Millennium Park and you'll see Pritzker Pavilion light up the landscape with it's extraordinary crushed aluminium can architecture and sharply angled surfaces. Also in the Millennium is the now much-loved 'Bean' - go on take a photograph in the reflective surface! The Magnificent Mile on Michigan Avenue North begins at the Wrigley Building on the north side of DuSable Bridge and is a seemingly never-ending (because it'll take you all day to walk it) mile of top end stores and hotels like InterContinental Chicago, Conrad Chicago and the Marriott Chicago. 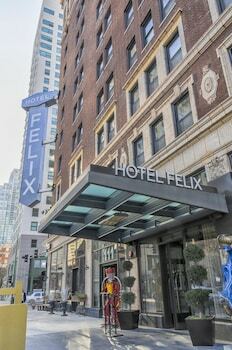 Do make sure you book your discount hotel room in Chicago soon, though, the city is popular all year round. Native Chicagoans have been enduring arduous winters in the Windy City for aeons - so they have it licked when it comes to wintertime activities in this most pretty of winter cities. Check Cheaprooms.com and get yourself to Chicago with a cheap hotel packageto suit every budget and every family-group size. Chicago in winter is cold - so rug up, and better yet, check the weather forecast for Chicago before you come so you know what to pack for. Find cheap accommodation in Chicago and get ready to enjoy all there is in this action-packed city. A little bit of cold weather makes you appreciate the warmth all that much more - so our first tip is to enjoy the exquisite Lincoln Park Zoo. It's family oriented fun with luminous displays of the animal kingdom, as well as the sheer pleasure of seeing animals such as polar bears and more in their naturally cold habitats. Luminous? Yes indeed, the zoo folk have created a quite spectacular light display that will shine on like crazy diamonds throughout the Christmas holiday period. It is winter after all, so why not go in search of fun family ice-skating at Millennium Park? Not only is the Park home to outstanding architecture and inspiring cultural programs during the holiday period, but you'll find activities like the afore-mentioned ice-skating. Not that we want to be gender-specific in our recommendations, but the dress exhibition on at the Chicago History Museum will delight all the little girls out there and maybe mom too. You can preview it on the web, but best to get down to this eclectic collection and just soak up the atmosphere of dreamy nights and felicitous dinner engagements. Looking for a little cheap entertainment? The Chicago Cultural Center is directly across the way from Millennium Park and there are free concerts from Monday through Wednesday. Chicago's wild reputation was consolidated in the 1920s and 1930s when gangsters ruled. Al Capone was just one of many and today, touring the old 'hotspots' is a Chicago must see. Check cheaprooms.com now and find a cheap hotel in Chicago so you can get ready to enjoy a bang up time in the windy city. So you've loaded up the Cadillac and got the spats on, so just what are the gangster hotspots to see in Chicago? Depends on your favorite gangster story of course, but we do have some recommendations. Do make sure you book your discount hotel room in Chicago soon, though, because the best off-peak deals go quickly. The worst gangster of them all was John Dillinger and he met his maker outside the Biograph Theater in Downtown Chicago on North Lincoln. He was the hardest working bank robber in American history and Public Enemy No 1 at the time. Al Capone's claim to fame is a quiet little park on North Clark St. The scene of the bloody Valentine's Day Massacre is shrouded in trees and looks serene. Nearby is the Green Mills Cocktail Lounge, owned at the time by one of Capone's men and steeped in Prohibition history. It's a retro classic and live bands still play jazz most nights. If you really want to travel back in time to a nastier, seedier place, take an Untouchables Tour and get the low-down on a gun-riddled past as you cruise past a variety of gangster locations. Some cities have beaches; some have an incredible nightlife... some have some of the best cultural institutions in the country! Welcome to Chicago. Check cheaprooms.com now and find a cheap hotel in Chicago so you and your family can enjoy the very best of the windy city for less. Of course, coming to Chicago means a little Chicago weather but we're sure you're tough enough. Do make sure you book your discount hotel room in Chicago soon, though, because the best deals go quickly. If you're travelling with kids the Shedd Aquarium is an ideal first museum. Full of interactive displays and special cartoon intros make learning fun! Did you know? Chicago boasts the largest science museum in the western hemisphere at Hyde Park at Lake Shore Drive and 57th Street on Chicago's South Side. You'll find everything from a coal mine exhibit to a WWII German U-boat in a building that has housed collections since 1933. No city is complete without a museum dedicated to art and the museum in Chicago dedicated to art is the Art Institute of Chicago. It's at 111 South Michigan Avenue and houses French Impressionists, African art, modern art and constantly changing special exhibitions. If you fancy a little nightlife with your good cultural deeds, look no further than the Adler Planetarium and combine the two! It's the first and oldest in the country and houses a unique collection of early instruments as well as sophisticated sky gazing.